well i have to agree but I read a book about samurai's and it also mentioned that he had an apprentice named I believe shiro Muramasa. Muramasa's earliest known work dates to 1501. The Masamune most people refer to (there were three smiths who signed their work Masamune at various periods), worked mainly in the middle 1300's. The two could not have known each other. There is an idea that because of the prohibitions by the Tokugawa (we are talking much later after both men were deat and gone) against Muramasa's blades - considereing them bad luck - the MURA character was cut off the tang and MUNE inscribed. Thus MuraMasa became Masamune, and thus the officials couldn't get upset. This might be the source of the confusion in thinking the two are somehow connected. Just as an aside, just because something is signed with a name doesn't mean it was made by that smith. It was not uncommon for Japanese smiths for a long time to sign thier master's name, change their name, flat out try to swindle somebody with a fake/famous name, or just not sign it at all. This makes a huge headache out of tracing pedigree. that was an intersting article. In a way I had a feeling that Japanese swords would break... even the Samurai book I read said they break eventualy. But I guess in order to get that fine cutting, they wanted a thinner sword. Also the sword was light enough to folow through with defensive and offensive sweeping motions without hindering thing sword bearer with extra weight like the Medievil swords. THen we may have to look at the fact that certain blades were possibly crafted for a one time use when the intent of killing a high ranking officer was in the works......as u may know they did test their swords on dead bodies to see how well they cut them in half. You gotta remember that swords arent created to block or parry other swords; fights would last 2-3 seconds tops, and a well placed slash would expose the innards of the losers throat. I reckon using them improperly like that, to block other steel weaponry, would attribute to even the finest of blades to dull and break. Sword fights of the day are nothing like sword fights of the movies. Unless you are talking French fencing. And speaking of French fencing and duelling, I know this is off topic, but has anyone heard of legendary fencer, La Maupin? your right and I didn't quite clearify that in my last statment. But I am aware that the Japanese swords were used for mostly quick kills. perhaps that is why the Naginata was use for war times. No I didn't hear about the sword fighter La Maupin but I would like to know if Zorro or the Musketeers were really real. Also the sword was light enough to folow through with defensive and offensive sweeping motions without hindering thing sword bearer with extra weight like the Medievil swords. We do have an image of western swords being big and heavy. Some where, but they were designed for a purpose and needed to be heavy. We should keep in mind the variety and constant development of armor. If a sword was made to be heavy, there was a very good reason. "European" does not equal "heavy" all the time. If you are talking about swords designed to be used with one hand (or two with a longer grip) they were often as light or lighter than Japanese blades. It would be silly to make a sword that puts you at a disadvantage. Even the biggest swords tend to top out at about 5 lbs - so I have been told by people who practice those styles of combet - and most single handed blades stop at around 2 to 2.5 lbs (about the same as a katana). I hadn't heard that before I would be interested in learning more. Do you have a source I could go to Tetsunihon? as u may know they did test their swords on dead bodies to see how well they cut them in half. Plus, why take the chance in ruining a good blade? Bone can catch a blade or chip and edge, and I have heard stories that reed mats can bend a blade if you don't swing right (Japanese blades are not known for flexibility). I think cutting tests were more like crash tests for cars - a way to check to see if you have the right idea for your product. I don't know weather the spelling for Muramasa is correct, but according to the novel of James Clevel, Shogun; that sword was called Murasama, but the story of it is the same as the story of "evil sword". And I actually meant that Masamune's blades were amoung the best blades in Japan and as I learned later Muramasa or Murasama, was his apreantice and tried to make the same good swords. Wakarimasu ka? yes just resently I noticed to, even in final fantasy tactics there is a sword call murasama, but rather the two names are related that is some thing I will have to check out. But so far i have a book called Secret of the Samurai and it actually mentions Senzo Muramasa as the apprentice of Masamune. And yes he did make good swords but apparently they were probably so thin and sharp that they easily cut through things and broke easily. On the other hand Masamune supposedly commended him for the craftmenship anyway. Musketeers were real. They were basically the first organized rifle infrantry men. The 3 Musketeers on the other hand, I'd reckon were fiction. They didnt even use muskets, did they? Muramasa and Masamune were people, not swords. Clavels's book is a novel, not a serious research-based book. The famous Masamune and Muramasa have no physical connection to each other. Several smiths (on the order of 30) were named Muramasa or Masamune over the years - only two were ever famous. Senzo is not the Muramasa who has all this hype about his swords being cursed. This is probably because Senzo's swords were basically worthless, if what tetsunihon says is true (about the brittleness). Samurai, until about the Tokugawa shogunate (1603 to 1868) put a much greater value on functional than decorative weapons. But I am aware that the Japanese swords were used for mostly quick kills. perhaps that is why the Naginata was use for war times. Naginata (a type of halberd) were used like many long weapons - keeping the enemy away from you. The also were, much, much, much (etc....) better at busting through armor than a sword. Swords in all cultures were weapons of last resort on a battlefield. Kind of like a military sidearm today. Sure, you could kill someone with a sword, but there were much better and less risky ways of going about it. We shouldn't ascribe to the samurai some kind of superhuman ethical code when it came to battle - like I mentioned somewhere on the thread earlier. Samurai suffer from so many misconceptions and romatic notions. A few Japanese authors get sentimental in the 1700's and suddenly every samurai ever born was a steeled, cool eyed warrior. Not so. Western media gets ahold of this and suddenly it becomes the truth... Samurai would just as soon resort to deception and guile to win. Many a samurai was cut down by other samurai laying in wait. Even Musashi, seeming everyone's favorite samurai, won several duels using surprise as a weapon. does anybody know or heard of Masamune and Muramasa? I knew i'd heard this before so i checked my books. As the story goes Muramasa-san was visited by a fellow smith, when he turned his back to check a blade the visitor dipped his hand into the quenching trough. Muramasa-san saw this and sliced the man's hand off with the blade he was inspecting. Apparently he never drained the trough to remove the blood so from then on his blades were deemed to be possessed with vampiritic demons. As for the test cutting or "Tameshigiri" this practice was often carried out using corpses however, it was also very popular amongst certain Daimyo to use criminals or prisoners for the practice too. Oda Nobunaga was apparently very fond of literally using "live" targets. I well aware of it, but that novel based on a true story of an English man who came to Japan on Duth ship in 1600 right before Tokugawa Iyeyasu seized the power of the Shogun and was favored by Tokugawa. The information in that book is historicaly correct only that Tokugawa is called Toronaga, his eldest son called Oda and Muramasa is called Murasama. Other then that, information is correct and James Clevel consulted different people in Europe and Asia before writing that novel, even the main rival of Toronaga for the Shogun's power is Ishido, the one who was defeated by Tokugawa at Sekigahara on October or November of 1600. I think it's more than just a coincidence and by the way, the story of an "evil sword" is also used in the book and mentions all of the things happened with it and Tokugawa family and some more. It's says that Toronaga's grandfather had been assossinated by Murasama, then Murasama sword nearly cuted off Toronaga's right arm and bled him to death when he was a child from out of nowhere, also that sword decapitated his first born chiled, the one who commited suicide as I belive. As I perceve it, that is the same story as the story of a real historical figure, only different names or spelling were used for the novel, or there might had been some changes in spelling made since the novel was writen. It is very easy to apply fantastic stories to famous people in history. All groups and cultures do it. Lets face it, we love a good story. It gives a bit of color to the past and lets the imagination run a little wild. There is nothing wrong with that. The problem, and much of Japanese history suffers from this, is when the stories beging to take on the appearence of fact. Just because it was in a book doesn't make it real - I know I am preaching to the chior here - history is a very malleable object as governments, story tellers, the media and even academia have shown again and again. So what you are trying to say is that what was said earlier about Tokugawa and Muramasa is not build upon true fact ??? Based upon fact and being a fact are two very different things. No, the Tokugawas did consider blades made by Muramasa unlucky and the events similar to ones you mentioned did in fact happen. Tokugawa's grandfather was killed by a sword Muramasa made (though not with that goal in mind), his father was attacked by a drunk with a short sword made by Muramasa and Tokugawa cut his hand, not his arm, with one by accident. I have never heard of Tokugawa's first born decapitated, but if a sword by Muramasa was used, I think it would be out of respect for his high position (when you commit ritual suicide you have a second person to cut of your head after you cut your belly. This is a position of great responsibiity and a terrible dishonor if you botch the beheading. It seems naturally to me a blade that would be really good at cutting would be selected. Muramasa were said to be some of the best - a logical choice for the situation). What I was trying to say is that somehow then extending some kind of curse to all blades made by Muramasa, or that somehow this curse was brought about by a severed hand in a quenching tank, etc. similar stories surrounding the samurai, Japanese swords and history should be approached with grave caution. For example let's look at the Muramasa - Tokugawa thing. Muramasa's swords were very good at cutting, so it has been said. Samurai would have kept them around. Let's face it, a great sword doesn't come around everyday. Thus, you have the elite of the elite carrying around these weapons because they are rare and marks of great status. Is it that surprising that when the elite fight other elite, the rare class of weapons they use will naturally do the killing? Only one death and two woundings (one wound being self inflicted) in the Tokugawa family over a period of three generations (some 60 years with 20 years to a generation) were caused by Muramasa's baldes. It wasn't as if around every corner was an assassin with a careful picked Muramasa blade at the ready. Muramasa did not make blades in some dark workshop in league with the devil chucking "heh, heh, heh...this one will be the end of the Tokugawas..." Muramasa would have been dead by the time the Tokugawas were in any position to restrict his swords. Let's not let the eccentric concerns of an absolute ruler or two impact too much on our interpretations of history. You know what they say, live by the sword, die by the sword. If all the men in my family were all carpenters, and three of the most important had suffered some injury on a Craftsman saw of some sort, I think it would be natural for my family would develop an suspicion of the brand, wouldn't you? If we happened to be all powerful despots to boot, I also think we would ban or restrict the sale of Craftsman tools. Or think of it like this - instead of swords, modern day samurai would kill each other with cars. Bently make some of the best looking, best working cars on the road, something any samurai would die to be seen in. Now a few Bently owning samurai hate the Tokugawas and a chance to kill a Tokugawa comes along. Our Bently owning samurai takes the chance, just like a Muramasa owning samurai would in feudal Japan. So now the Tokugawas are jumpy about any Bently they see out on the road and for a little peace of mind impose restrictions on who can own and drive Bentlys. Same thing for Muramasa's swords. But coincidence and logic are pretty boring. A story about a curse and evil Muramasa blades longing for the taste of blood is much more interesting. And there is nothing wrong with that as long as it can be kept in perspective. Remember, based on fact and being a fact are not the same. I wouldn't for sure, but I'm sure they were using guns by then anyway and the musketeers was probably a name given to them from the king. As for three of them, maybe they were three friends who stumble apon a plot and got the whole group to help the king. Masamune was an old swordsmith master whose apprentice Muramasa was gaining fame each day because of the perfection of his craftsmanship and the seemingly inherint ability of his blades to deliver clean kills with every stroke. Upon the day of his death a noble lord asked Muramasa how he came to deliver such fine blades. Muramasa said "when I complete a blade I dip it into a stream blade first and hold it until a floating leaf comes in contact with the blade. If the leaf is sliced cleanly in two then I knew it as ready." The noble lord was impressed greatly and started to shower praise upon Muramasa when Muramasa stopped him. Muramasa then said "my blades were fine but not as fine as my masters. 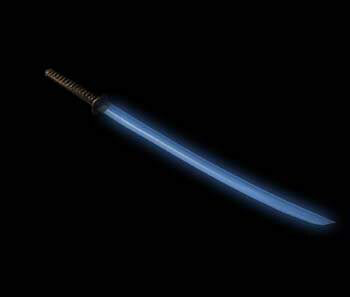 I have never made a single blade that compared to Masamune's." The noble lord asked how this could be and Muramasa responded "when my master placed his blade in the stream he also waited for a leaf to float towards it. But the leaf floating directly towards the edge of my masters blades always miraculously went around the blade missing it completely. You see... my masters blades had the ablilty to protect life and preserve the order of things. Mine could only kill." Anyways it was something like that... I always remembered that story even now... twenty-five years later. Fact or fiction Muramasa and Masamune are men not to be forgotten. I think the blades of these craftsmen were great in their time but probably nothing like the legends say.. Legends tend to be MUCH better than the original..
but as I always say..
that is a great story, especially since it has roots in fact. im sure it is one i will remember as well, thank you. Someone mentioned it earlier about Masamune's descendant, i saw a TV documentary about it recently on the history channel. I think the guy lives and is based in a city somewhere southwest of Tokyo, i think it's Kanagawa, or some city beginning with K anyway. If the program is on again i'll write it down and post it up. Hello Everyone, I am brand new to this forum. I live in Kamakura Japan and own a golf company in Tokyo. I too have watched an English program about Famous Japanese swords and it has inspired me to begin my collection. I have been asking all the sword makers who the best sword maker is as of now and they all sent me to the same place in my very own town. Today I ordered my very first sword in my collection, it is made by the verified and authentic 24th Generation masamune ancestor. My sword will take 2 years to make due to the wait list. I am their first foreigner ( American born in Hawaii ) to have ever entered their shop for a sword. The sword will take 2 months to make but a total of 2 - 3 years due to the wait list ahead of me. Please bare with me I am a noob in the art of fine Japanese swords but not a noob in regards to collecting rare items from all over the world. I ordered a Katana, with inscribed Kanji and it is the blade only for 1,600,000yen or 15,000 U.S dollars. Masamune the 24th did not speak any English and my Japanese is broken but his 2 apprentices spoke English very well and told me there are only 47 masamune swords ever made and almost all of them are in museums as national treasure. Masamune the 24th has one hidden somewhere and it is supposedly the finest sword masamune has ever ever made passed from son to son for 24 generations. Of course I asked how much, the answer was there is no price because its priceless and his family's air loom. I later found out that one of the apprentices was his son and still called him Master. I am very excited to get my sword, they even tried hard to turn me away but after hearing he is the ancestor and the secret diluted yet still very in tact would be a part of making this sword I could not resist. I am very excited. I am looking for some sort of education about masamune can anyone help me? Well, this thread for starters! Also, sheck out www.swordforum.com and search there for "Masamune." You will find a ton of stuff. Happy hunting. The historical Masamune's familiar name is Goro Nyudo. Masamune is probably the best known Japanese swordsmith of all time, as well as a well-known philosopher. Masamune is believed to have worked in Sagami Province during the last part of the Kamakura Era (1185-1332), and it is thought that he was trained by swordsmiths from Bizen and Yamashiro provinces, such as Kunitsuna and Kunimitsu. The first famous swordsmith active in Kamakura, Sagami province was Shintogo Kunimitsu. It is claimed (in Kanchiinbon Meizukushi) that he was a grandson of a swordsmith of the Taima school in Yamato province. It is generally accepted that Kunimitsu had two pupils, Yukimitsu and Masamune. The earliest among Kunimitsu's works are those reliably dated to 1293 and the latest dated 1324. Judging from the dates of Kunimitsu's works, Masamune was active from the end of Kamakura (1185-1332) to the very early years of the Nanbokucho (1333-1391) period. Masamune is credited with creating the Soshu tradition of swordmaking during his career. "Soshu" or Soshu Kitae as it is formally known, is a seven layer lamination technique used in making the blade. The heart of the blade is formed from softer, more malleable steel giving it exceptional flexibility. There is then a layer of slightly harder steel bonded to each side of the blades heart, giving it support. The last layers are a very hard steel bonded to the top, bottom, and both sides of the core forming the ha (cutting edge) mune (back edge) and shinogi-ji (blade flats). This form of laminar construction provided for a sword that could be sharpened to a razor edge due to the hardened steed used for the ha, but was extremely resilient to battle damage due to its softer more flexible core. Masamune's adopted son, Sadamune succeeded him as master of the Soshu tradition. In addition, legend has it that there were "10 Disciples of Masamune," or ten swordsmiths that continued working in Masamune's Soshu tradition of sword making, and that several already well-known swordsmiths also came to study with Masamune. The Masamune Jittetsu, as these smiths were called, worked in their own tradition as well as studying the techniques of Masamune. Regardless of whether or not this is a historical fact, the swordsmiths working at the end of the Kamakura to the Nanbokucho periods produced works with the surface texture featuring nie, a distinguishing feature of the Masamune style. Nie are areas of bright crystalline structure in the hamon (temper-line) or ji (the blade surface between the ridgeline of the blade and the hamon), resulting from the interaction of the steel during the quenching process. Masamune's style is often referred to as "the beauty of nie," putting his blades in distinct contrast with Bizen blades. Masamune created many superb swords, and all of his surviving blades are considered national treasures in Japan. Seeing his signature on a sword is extremely rare, and there are just a few swords authenticated as his work. This body of work includes a few unsigned swords attributed to him. Their splendid craftsmanship has led to the high praise of Masamune as a master swordsmith. "Fudo Masamune," "Kyogoku Masamune," and "Daikoku Masamune" are accepted examples of his genuine works. Masamune's works are the most frequently cited among the swords listed in the Kyoho Meibutsu Cho, a catalogue of "excellent swords" in the collections of daimyos edited during the Kyoho era (1716-1736) by Hon-ami. Today, the name Masamune has become synonymous with "an excellent sword".